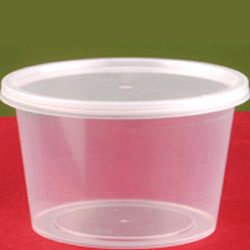 With more people opting for take away food Take Away Plastic Boxes are gaining in popularity. Made from sturdy molded plastic these boxes can hold both hot and cold food keeping the content inside in freshly cooked manner. These boxes are airtight and made from food grade, nontoxic plastic. 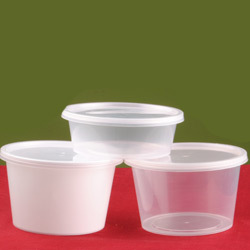 We offer take away plastic boxes in a variety of capacities and designs at most competitive prices. As the take away is getting popular take away plastic containers are coming in very handy. We offer a premium range of Take Away Round Containers made from nontoxic, food grade plastic that has no adverse effect on the food content inside. We offer these round containers in a range of attractive colors and capacities. Our prices are most pockets friendly. The Take Away Square Container offered by us is a great means of taking away food parcels in most safe and uncontaminated manner. Made from high quality, food grade plastic these square containers is good for all types of food, cooked, frozen, fresh salads, sweets, snacks etc. This cost effective range is offered in various capacities and can keep the food fresh for a long time as it is closed with airtight lids. Quality, we believe is the motor that drives the engine of a business. We ensure our products earn the reliability and trust of our clients by using raw materials that are undisputed of the highest caliber.